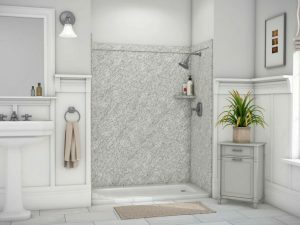 There are a few things to consider when selecting tile for your shower from how it looks to ease of cleaning and picking a product that will last. The two main considerations are the material and size of the tiles. 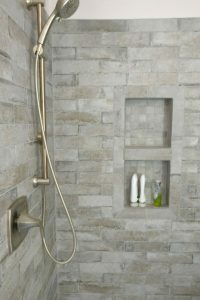 The more textured the surface and the more grout lines, the harder it will be to clean your shower. You should avoid polished tiles on the bathroom floor as it can be very slippery, but polished tiles are great for shower walls and help make an even surface for easier cleaning. Matte tiles that are smooth are not hard to clean either. Imprints and textures contain grooves that can retain dirt. Larger tiles help you cut down on those pesky grout lines but it doesn’t mean you have to eliminate small tiles altogether. A mosaic stripe or accent wall is a great way to incorporate the small tiles without adding a lot of extra maintenance. Porcelain tiles (left photo) are durable, stain resistant, and hold up well to water. These tiles are available in sizes all the way up to 5 feet by 10 feet! They come in a variety of colors and patterns including stone and wood-look tiles which gives you plenty of option and allows you to express your style. Ceramic tiles are a slightly less durable version of porcelain. Because of this, they do not come in the larger sizes and cap out at around 24” x 24”. Still available in a wide variety of colors and patterns, ceramic tiles have a great value at their lower price point and make a good option for tiling walls since walls don’t accrue as much wear and tear as floor tiles. 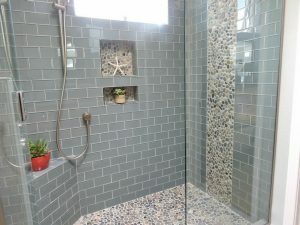 Glass tiles (right photo) are also durable and water resistant but have a very unique transparent look. This look can range from beachy to elegant. Glass tiles come in small to medium sizes but are rarely offered in large tiles. Natural Stone (left photo) is beautiful but is costly in more ways than one. Some of the most common include marble, limestone, and travertine. Natural stones are generally quarried and imported which means a higher price tag. They’re also soft and very porous which makes it more susceptible to chipping, cracking, and stains. Sealing the tiles on a regular basis will help, but in a high water traffic area like showers the seal wears down easily and the stone erodes and pits over time. You also have to be careful of the cleaners you use and their PH level. A way to accomplish this look without as much maintenance is by using it as just an accent. A small area is easier to take care of and can be placed in a location further away from where the majority of your water traffic is. Solid Surface (right photo) panels are an alternative to tile. They are lightweight and come in large sheets which makes them easy to clean with no grout lines at all. They have a printed pattern which may not look as nice but are much easier to install and come at a lower price point than most tile. Tile makes a big impact on bathrooms and is a great way for you to personalize your space. With all of these great choices, it is hard to pick the best one. 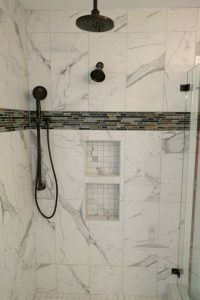 You can easily find a tile or a mixture of tiles that is right for you by weighing the pros and cons, the ease of cleaning, and style. To make an appointment to view the tile in our showroom and go over your project, you can reach out by contacting us here or by giving us a call.